I love poetry! I didn’t always feel this way, as a child it wasn’t of much interest to me, and now I feel like this was a great shame. I really want to engage more children with poetry because it’s a way to teach children to love words and language and gain confidence playing around with words, having fun and bending the rules of writing. Only more recently have I discovered the joys of writing poetry myself. It’s a challenge but so satisfying when you hit upon that perfect idea. I love writing little poems as gifts in cards or posting for people online, there’s something special about giving a miniature, carefully thought out piece of writing to someone … a little word present. And it doesn’t have to be particularly exceptional to bring a smile or mean something. 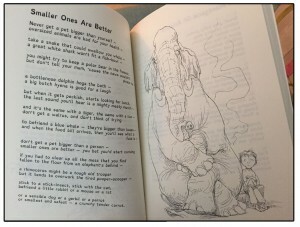 With the right books and the right teachers / role models, I think children can welcome poetry into their lives as enthusiastically as novels or comics. 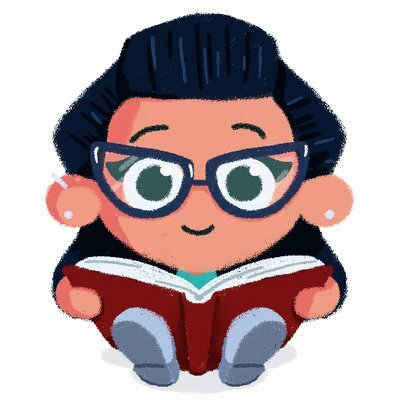 So, down to reviews! I’ve chosen two poetry books to look at by two gentlemanly gods of the poetry world! 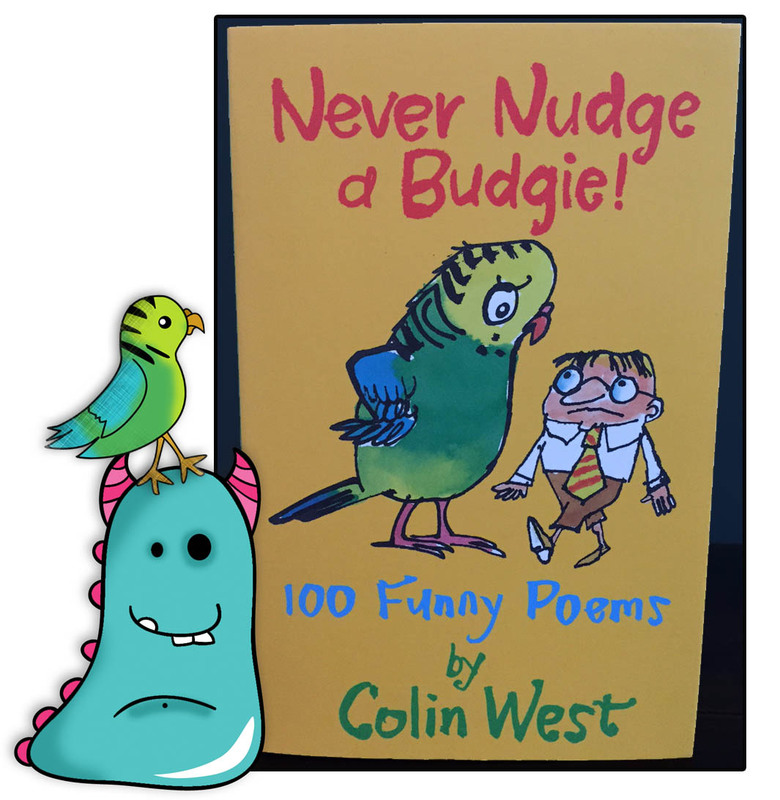 The first book up is Never Nudge a Budgie, 100 Funny Poems by Colin West. I settled myself down and devoured this wonderful collection of poetry in no time at all, and then went back and read it again and again! Some old, some new, all wonderful! The book is split into different clearly defined sections, so children can zoom in on styles or interests that grab them. This is the joy of poetry books, you don’t need to read through from beginning to end to enjoy, just dip in and out to your favourite parts as you please! 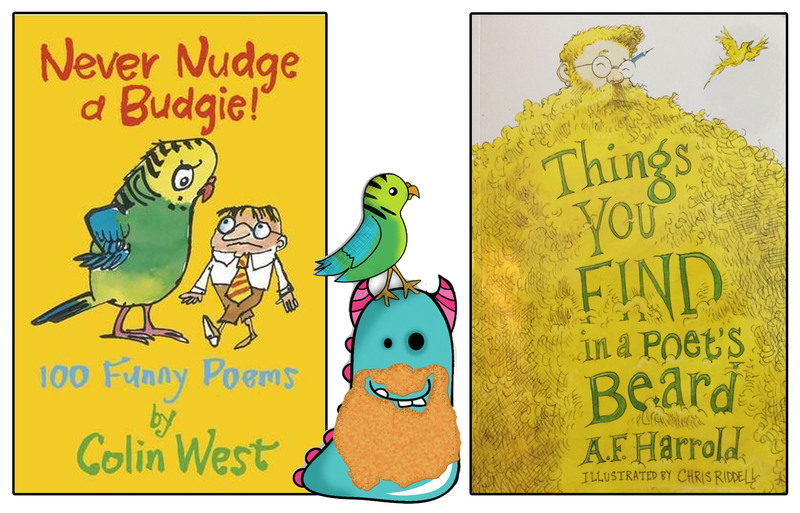 I loved Never Nudge a Budgie for the variety of poems within. You’ll even find a collection of tongue twisters in here that are brilliant fun to say out loud (that’s if you can). 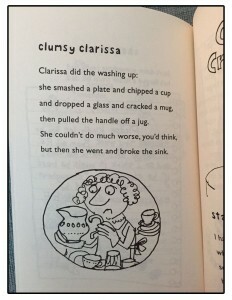 These are the kinds of poems that children remember, love and repeat for years to come. Colin’s fantastically quirky and sketchy styled illustrations decorate each page beautifully and add an extra dimension to his poems. They reinforce the humour behind the more subtle tales, making them accessible for young children too. The ABC of tragedy is a particuarly fantastic example and I’d be happy for this to grace my library walls as a much more fun way of learning the alphabet. His illustrations are full of expression and movement, an absolute joy to look at. Mr West uses visual effect in his poetry brilliantly in this book. In many of the poems the words seem to have a life of their own, little souls dancing around the pages. 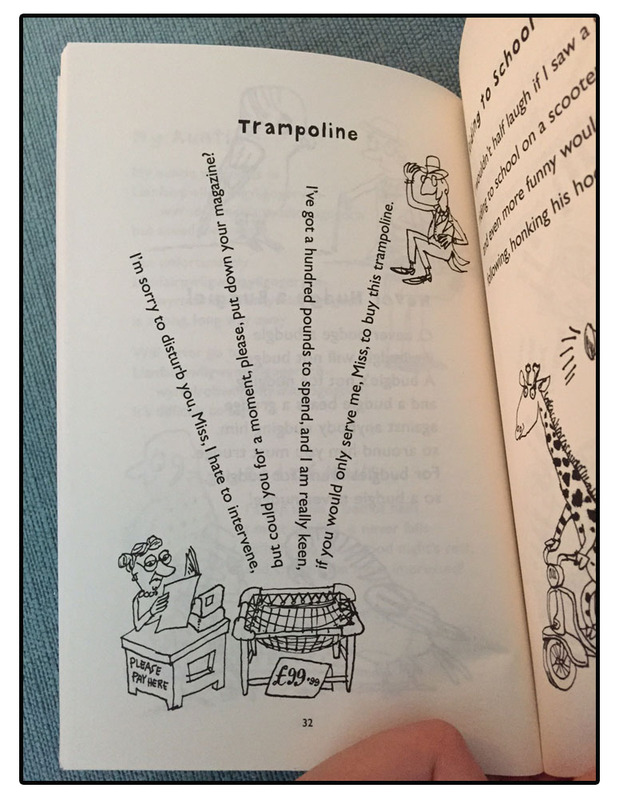 Trampoline and Rolling Down a hill are two of my particular favourite examples of poems that use word positioning to express the meaning! 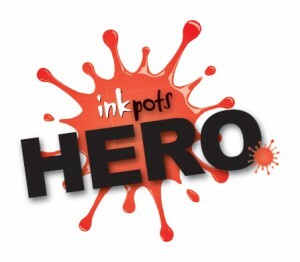 Clever, creative, fun and above all engaging! This wonderful book contains poems that will delight anyone, from those who enjoy nonsense rhymes to more realistic day to day rhymes. 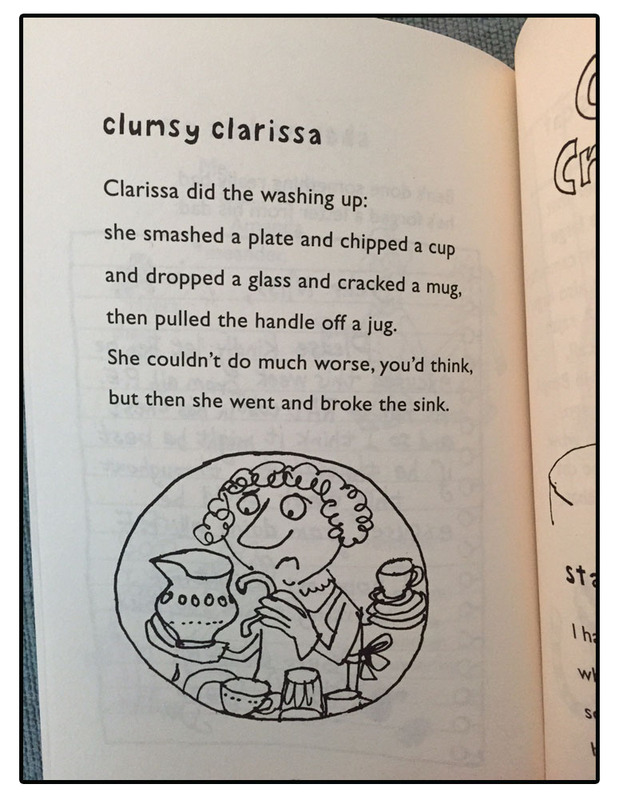 I have to admit to loving, more than any other the poem Clumsy Clarissa, as a notoriously clumsy person this made myself and all my family giggle as it’s so silly yet, for me, and I’m sure many others, completely accurate. 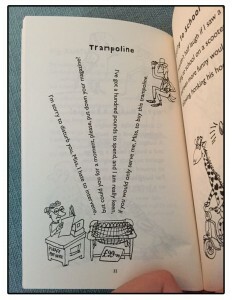 Colin is a genius at taking every day situations that we all identify with, and slipping in a little element of silly! This is an ideal read for the family, children young and old, completely daft, completely brilliant. Next up, as you can see Book Monster is sporting a rather fetching beard especially for our review of Things you Find in a Poet’s Beard by written by A.F. Harrold and illustrated by Chris Riddell. I know of A.F. Harrold for his fabulous Fizzlebert Stump books and more recently The Imaginary (shortlisted for the 2015 Sheffield Children’s Book Award). I’m a huge fan of these books so I was very eager to read his poetry. On first look, this book is ideal for the older reader, but the poems in here are flexible and would be fantastic performed to younger children and adults. Another wonderful collection that will appeal to many ages. Harrold’s writing style is a joy to read, just like his books there’s nothing patronising or dumbed down for his audience just incredibly clever word play. The humour varies from gentle rib tickles to all out ridiculous! Like Mr West’s book, The positioning of words within this book add to his poems meaning. It is much more subtle, by generally only changing the spacing in between words slightly, but the outcome is clever and really works! The Warning is a hilarious example of this, and it’s a poem that plays with double meaning of words. Horrible Poem tells the tale of a kitten eating monster and uses onomatopoeia (ie words that show sounds) and bold fluid text to exemplify the monster eating his pray. This would be the perfect poem to read out loud to children young and old and would make a great poetry writing project, creating something similar. We also have the joy of an alphabet poem in this book, and it’s equally entertaining as Colin West’s, with a great little twist at the end. The overall feel of this book really reminded me of Roald Dahl’s black humour from the people eating Wiggyiig to the poem Burying the Dog in the Garden, which I was hugely amused, yet slightly traumatised by. Brilliant in every way. You may be thinking this is a crazy silly book full of madcap ideas, dark humour and word play, and it certainly is that. But, what I loved most about this particular book, were those poems that appeared out of nowhere and touched my heart. My favourite of all was The Taste of a Biscuit which addresses grief in an all too real way. It’s incredibly accurate, heartfelt and beautiful, supported wonderfully by Chris Riddell’s gentle and sympathetic illustration. 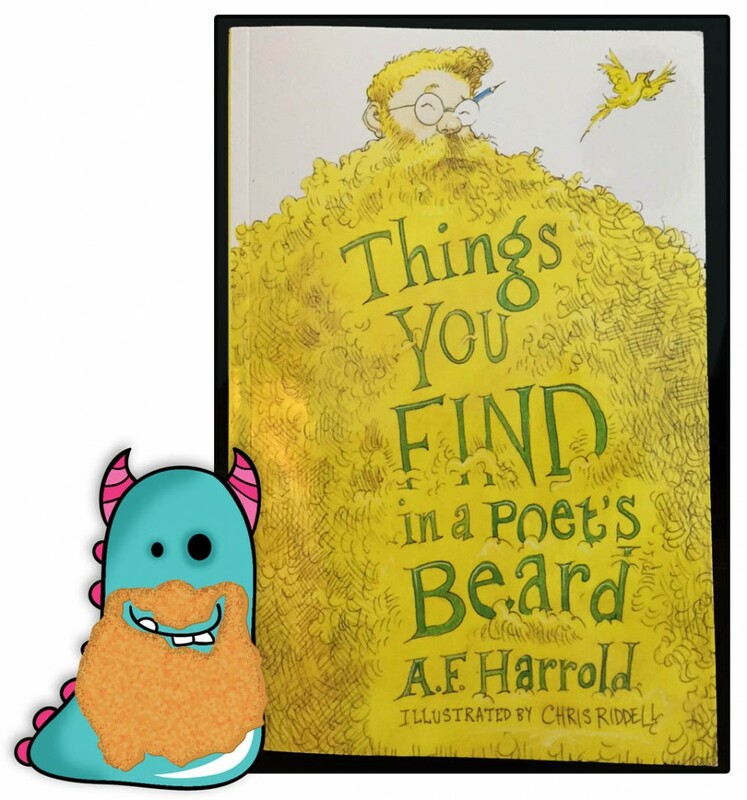 Chris Riddell’s illustrations bring personality and beards aplenty to this already fun packed poetry book. The illustrations aren’t overdone, as in most cases the poems are more than enough, but when they appear they couldn’t fail to bring a smile. 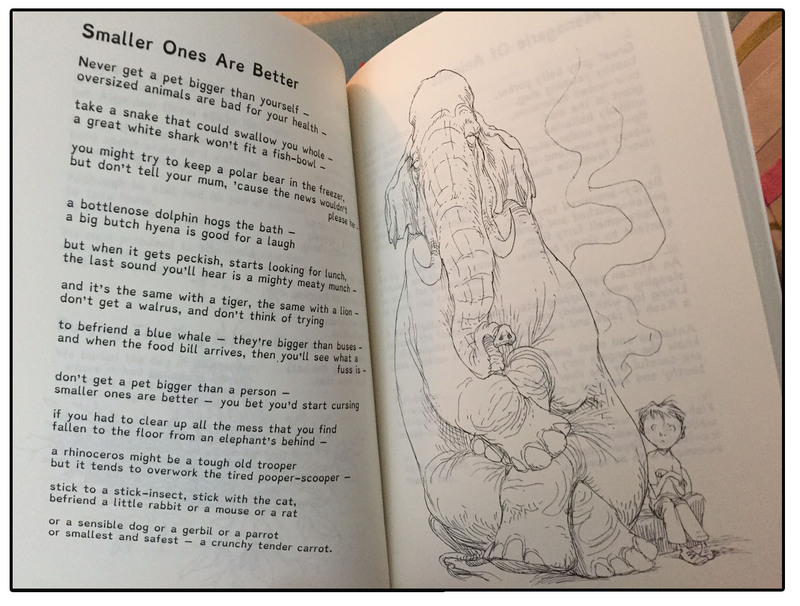 I had a particular fondness for the elephant sat politely, if somewhat grumpily, cross legged along with the poem Smaller Ones are Better. This book is a joy from the beardy front cover to the final sleepy rhyme. Packed full of a wide variety of poems, it would be a perfect book for school use, performance poetry and also to read just because! If you would like to purchase Things you Find in a Poet’s Beard you can do so on his website below. At the time of writing signed copies were available (Thanks to A.F. Harrold for signing mine). You can also find out more about Mr A.F. Harrold, watch a video of him performing (brilliantly might I add) The iced-Bun Song or just gaze upon his luscious beardy locks. So since this blog was written on National Poetry Day, why not have a go at writing your own little word present. A poem about or for someone you love or just like really a lot! If you do, please post in the comments box below we’d love to read them and will even give a prize out for the best one! and read them and read them until you go pop! For most excellent poems it’s the price you must pay.